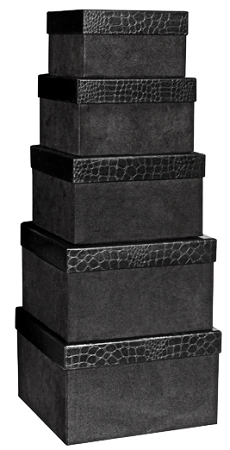 Five Black Nesting and Stackable Boxes. Be creative - put a gift in the smallest inside box for a big surprise! The Bottom features a suede-like material and the top has a glossy textured paper. ALL SALE ITEMS MUST BE SHIPPED IMMEDIATELY. ALL SALES ARE FINAL. NO REFUNDS, EXCHANGES OR EXCEPTIONS..